Timber is an amazing natural material that is an iconic inclusion in most Australian design projects. We have so many native varieties of timber which are just as beautiful in their raw state as they are treated in stains and finishes. By the hand of our talented crafts people, we are able to form timber into the most creative ways making our residential and commercial spaces so unique on the global stage. So why not think outside of the box and consider applying this amazing material in a less ordinary way in your home. Walls are often left for paint, hanging frames on or pushing furniture up against. Using this space to feature timber is a beautiful way to bring an otherwise ordinary wall to life. Depending on the room and the mood you wish to create, the tone of the timber and the way in which is it applied can take an everday space into something instantly special. We often use ceiling white to paint ceilings in a flat finish so it doesn't draw any attention from the rest of the room. 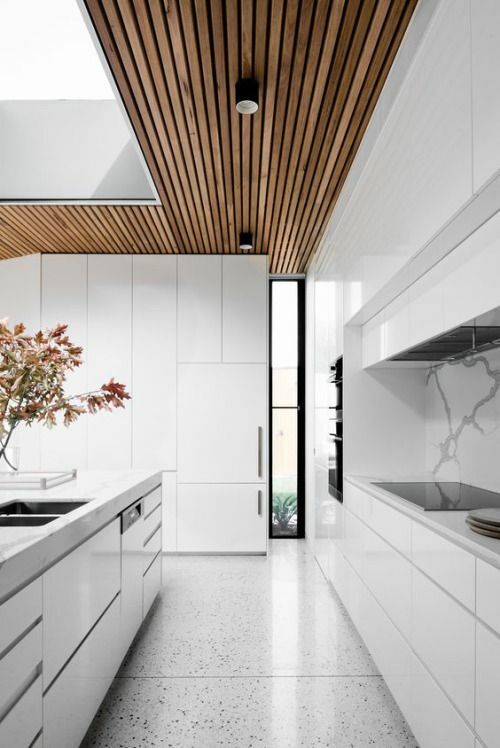 In the case where you may have higher thank normal ceilings or a sparse area, feature timber panels add warmth and bring the ceiling down into the room. The natural knots and tonal variation in the timber adds character and texture to a room that may be otherwise neutral. These same notes apply to an outdoor area that may be an extension of an indoor living area, bringing the indoors and outdoors together in a seamless connection. Timber flooring is certainly not an innovative way to feature timber in your home. However over time, the application and manufacturing of timber for flooring has evolved and we are now seeing a transition in how it is used. Designers are finding new ways to mix up the size, scale and proportions of timber and how it interacts with the rest of a space. Using paint and stain on timber flooring in the same space changes the feeling of the room and can lighten the weight that a lot of timber can create if space isn't in abundance. Timber and storage solutions go hand in hand from centuries past. 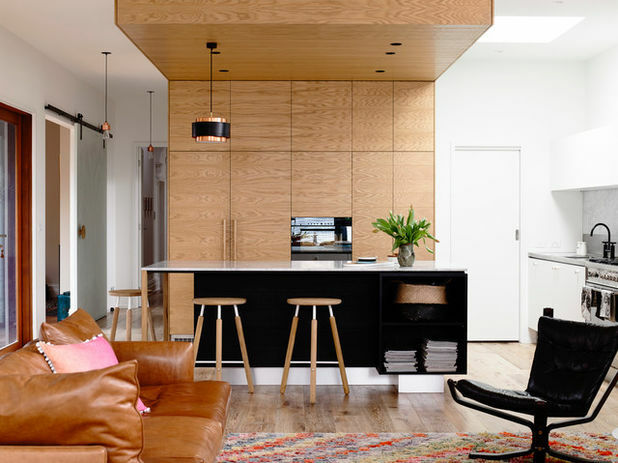 As space for storage is becoming more of a luxury, we are seeing built in cabinetry within kitchens, bathrooms and hallways as timber features. The addition of a timber bulk head (as seen below) is a real show stopper. Trends seem to dictate the materials we feature in our home decor. Metals, stones, plastics and timbers have been popular over time. Timber has proven to produce an interesting perspective on our day to day living, especially when crafted in to stunning pieces like these light pendants.